When going through life, a Type A personality like me, likes things mapped out. God, in His oh so funny sense of humour, created life to be much more exciting than a neatly mapped out beginning, middle and end. Isn't this list of stages nice and neat? 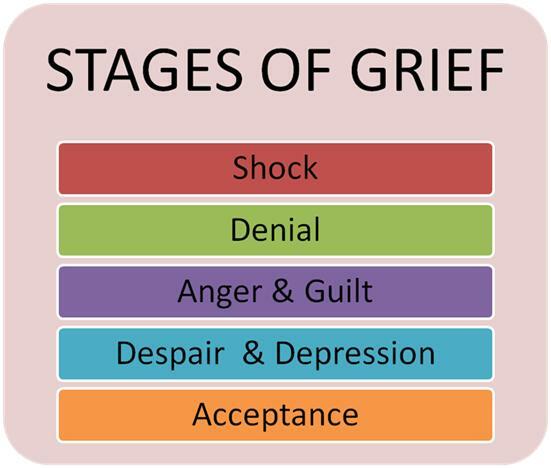 The thing is, when grieving, you don't go through each stage one after the other. You experience one, skip another, come back to a stage you've already experienced. 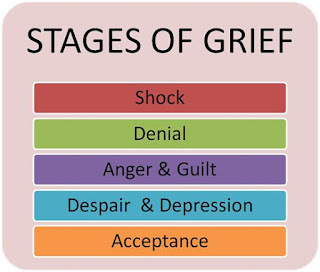 And sometimes I find that I go through every single one of these stages in the course of a day. It's exhausting. 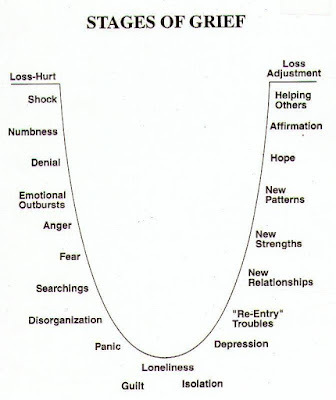 Although I bounce around in many of these areas, it feels like I am bouncing around the bottom of this curve these days. Disorganization. This is driving me crazy. I can't think straight. I forget stuff. All. The. Time. The other day I missed the turn off to our home and only figured it out 10 minutes later. This is soooo not like me. Panic, guilt, loneliness, isolation, depression. I can't wait to get out of these stages. I haven't had anxiety attacks in years and they are creeping up on me and it's exhausting telling my brain how it's supposed to work. 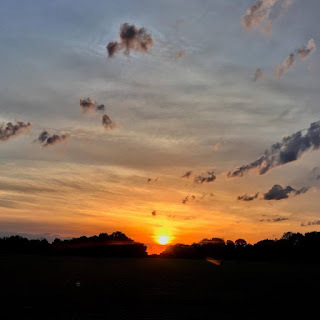 I think a part of me knows that even though I feel like I am taking things slow, it may not be slow enough, which brings up the factor of isolation and loneliness. Not enjoying those either as I try to figure out how to cope with these physical symptoms of grief. I think I am on the cusp of "Re-Entry Troubles" in that I "know" I need to redefine who I am after the loss of Mikail. I'm just not sure how to go about that, or what that looks like. 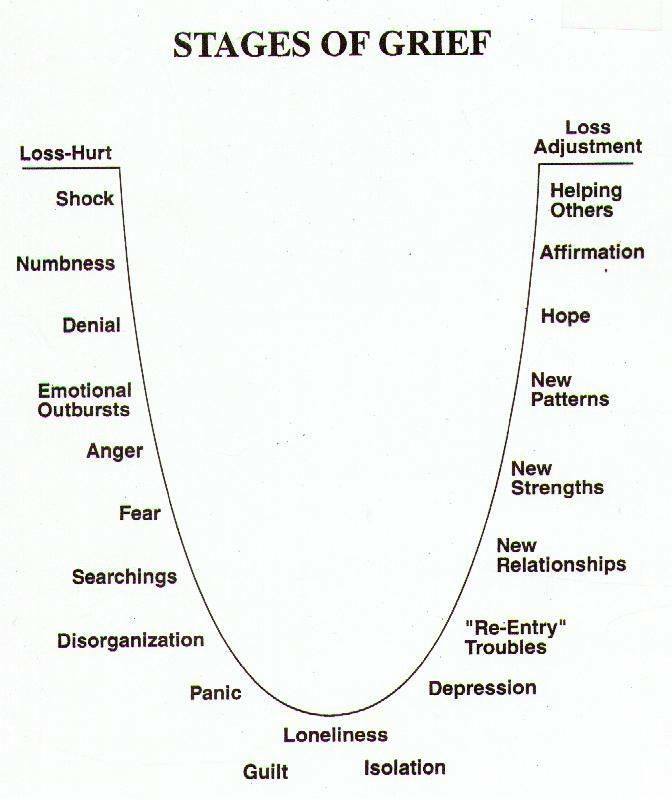 So, I bounce around the bottom of this curve a bit and hope to be on the upward swing sooner than later. I hope these visuals will be helpful to someone else walking the journey of grief themselves, or alongside someone they love. Redefining who I am without him... yup. I have already been grieving, as part of this process, my identity as his mother and all that entailed. 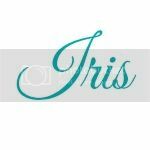 Hugs to you, Iris.